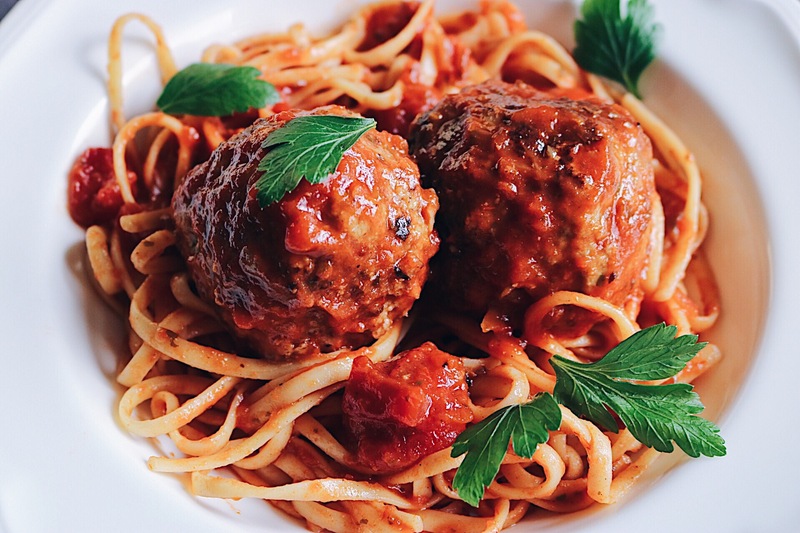 If you’re looking for a recipe that shows how much you love someone, this meatball recipe will be exactly what you’re looking for. I don’t mean showing love in that it takes a ton of work, time or sacrifice, because these really are pretty simple to make. 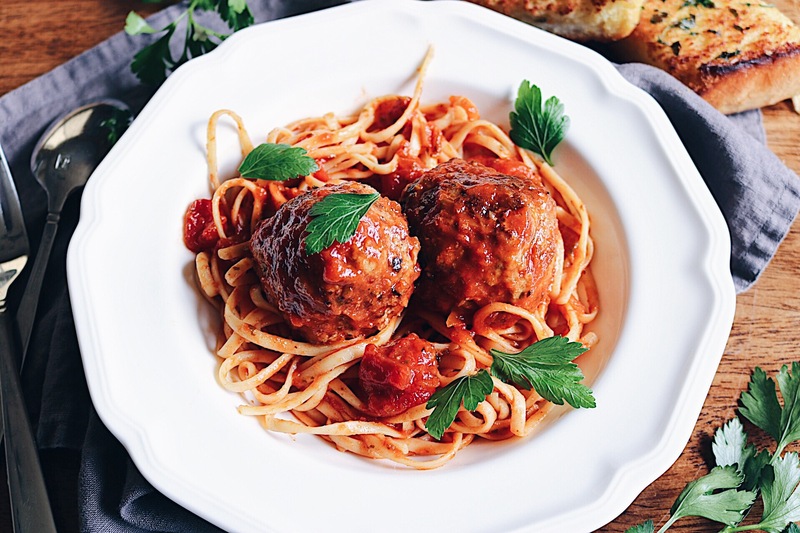 I mean love in the form of making something with your bare hands, taking the time to measure, mash, and mold these into flavorful, hearty and comforting meatballs for a beautiful meal. Giving yourself the time to show someone your love by feeding them a meal you thoughtfully prepared that you know they will deeply enjoy and hopefully go for seconds. A meal you can share with many and enjoy together. We first started making our own meatballs a few years ago when Eric wanted to give it a shot. Now we use that same recipe, that we’ve slowly adapted, and made into our own and I’m so happy to be sharing it with you. Now anytime we want a simple yet special meal this is our go-to. We’ve even picked up one of Eric’s Dad’s family traditions and started making them for our Christmas Eve dinner. Any meal you make a part of your family traditions shows just how special and full of love a meal can be. One that brings together your family to enjoy together whether it’s for Christmas Eve, telling stories at the dinner table, or a weeknight catching up on your favorite shows in front of the TV – as long as you’re doing it together that’s what makes it special. My parents were here visiting last week and for our Thursday night family night, the one night Eric’s home for dinner during the season, my mom and I made these meatballs for the four of us. We prepped the meatballs the night before and then browned them and baked them off the evening of. They make the house smell so good as they bake and then simmer in marinara sauce. We served them with a side of crusty garlic bread, grated Parmesan and some fresh parsley to complete the meal. It was a perfect family night full of love, laughs, and very full hearts and tummies. ♥ My parent’s visit was so special – like always! 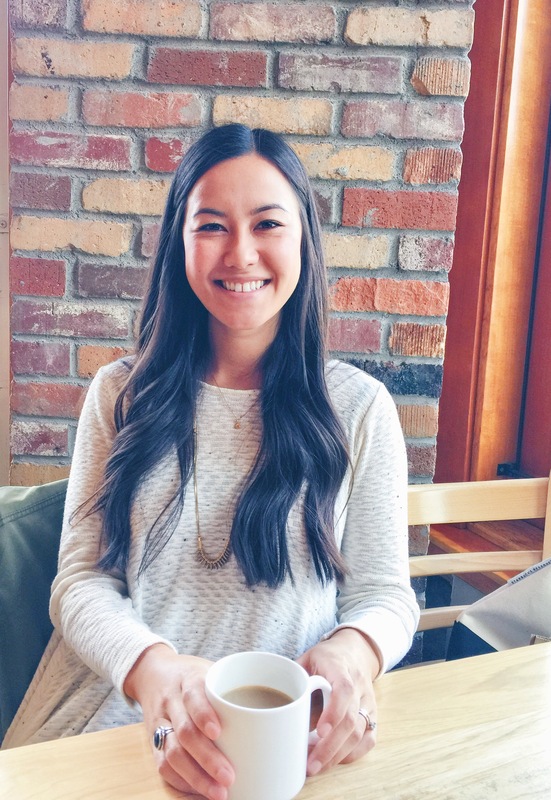 My mom came up for an entire week and we got to have a girls day in Spokane shopping, having a delicious lunch at Santé, getting caught in a rain storm and going to Trader Joes. We spent the rest of the week hanging out in Moscow, spending too much time at Ulta picking out a night cream 😉 , taking walks around town and making Homecoming goody bags for Eric’s players that included these chocolate chip cookies and some addicting Funfetti Puppy Chow. My dad arrived toward the end of the week for a long weekend and we got to go to the local flower farm and pick pumpkins, checked out our favorite spot Hunga Dunga for beers (the Cold Brew Coffee Stout was incredible! ), strolled around the UofI campus, enjoyed the Homecoming parade in downtown Moscow, tailgated and cheered on the Vandals at the Homecoming game. Can you spot my cute Mom? What are you favorite meals that have become a family tradition or that you love making for others? I’d love to know 🙂 I hope you love these hearty and comforting meatballs as much as we do if you give them a try. 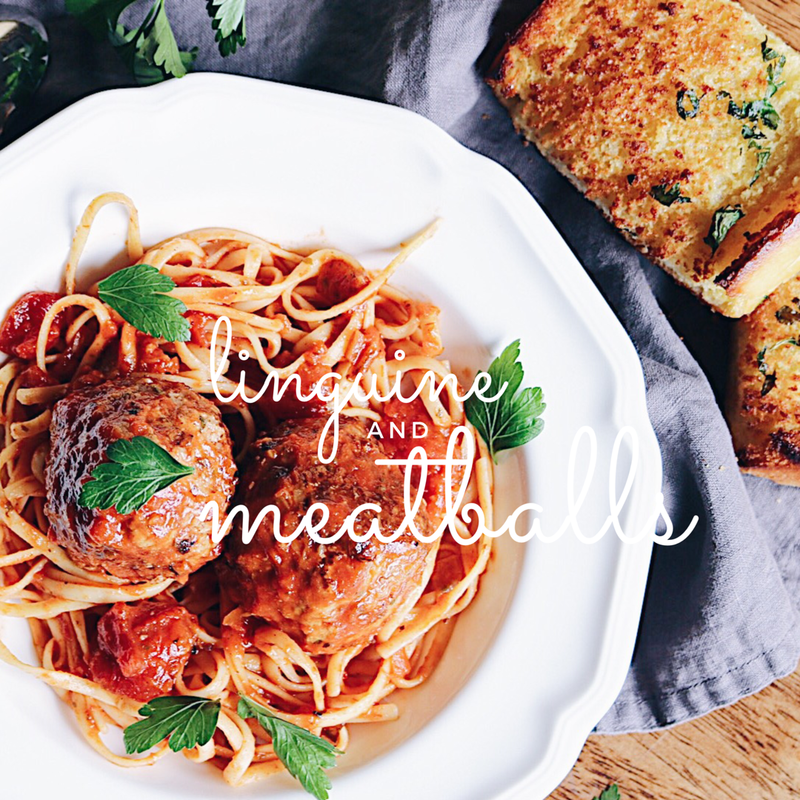 A linguine and meatball meal recipe to pour your love into and share with others. 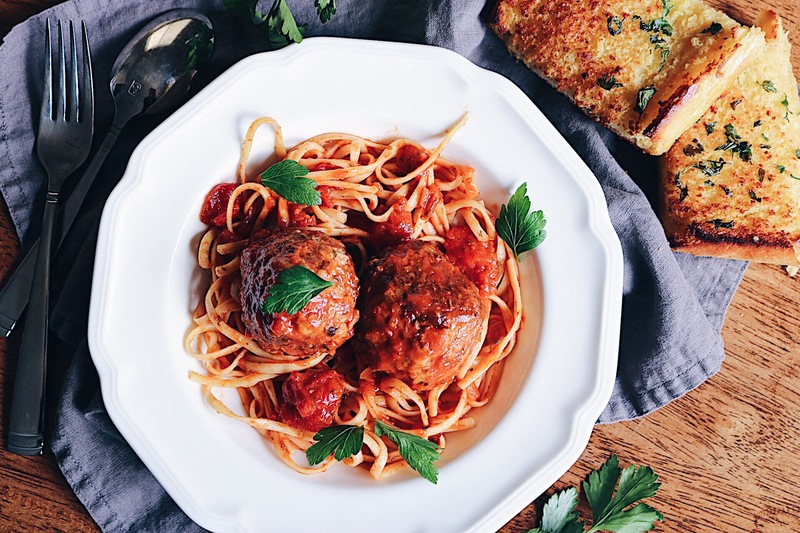 Preheat oven to 350 ºF if baking immediately after preparing the meatballs. Coat a large saute pan or cast iron pan with about 1 tablespoon of olive oil, add the diced onions and cook over medium heat. Season the onions with 1 teaspoon sea salt and let cook about 5-7 minutes, stirring occasionally, until the onions are very soft but have no color. Add the minced garlic and red pepper flakes and saute for another 1-2 minutes while stirring. Remove from heat and set aside to allow the onion mixture to cool. In a large bowl combine the meats, eggs, grated Parmesan, parsley and breadcrumbs. Squish the meat with your hands until it’s combined. Add in the cooled onion mixture, and 2 ½ teaspoons sea salt and squish the mixture some more. Next add the water and give the meatball mixture one good final squish making sure all of the ingredients are fully incorporated. Shape the meat into large balls with your hands. Squishing and rolling them into round compact meatballs. When I make this recipe I usually have about 15 meatballs formed. Coat the same large saute pan or cast iron pan with the remaining 1-2 tablespoons of olive oil and heat over medium-high heat. Brown the meatballs on all sides, be sure to turn them often to avoid burning them or from creating meat-cubes instead of meatballs. Place the browned meatballs on a baking sheet, evenly spaced, and bake them in the preheated oven for about 15 minutes or until the meatballs are cooked all the way through. Cook your linguine per package instructions. 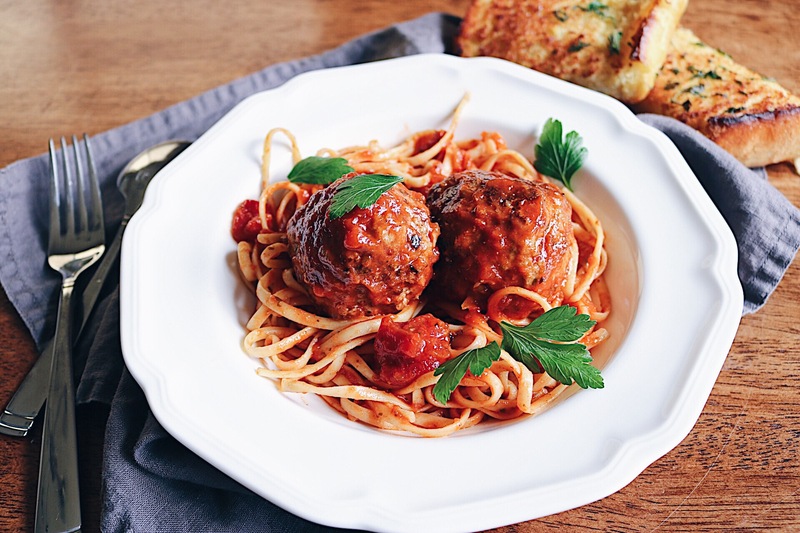 Serve the meatballs and sauce over the linguine for a seriously comforting meal. Don’t forget to top it with Parmesan and crusty garlic bread on the side to make it a meal. 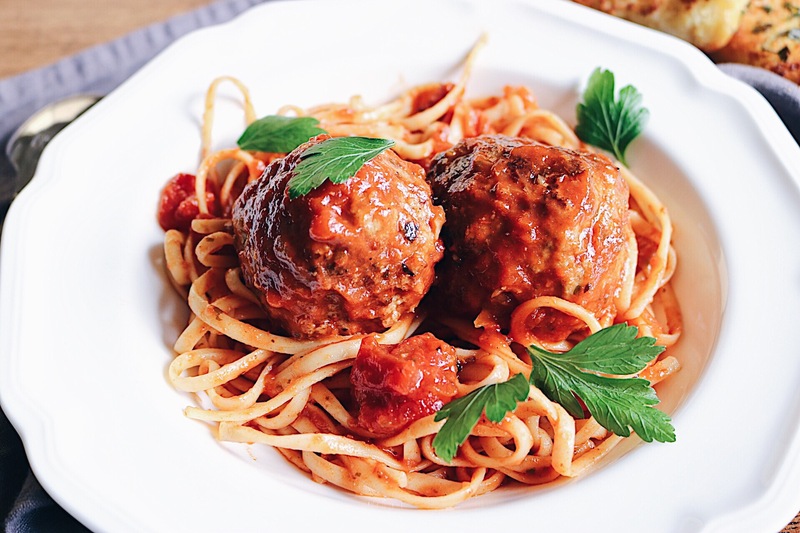 *If you’re making the meatballs ahead of time – once they’re finished baking let them cool and store them in an airtight container in the fridge or freezer. If serving from frozen let them defrost in the fridge overnight. From the fridge heat them in a pot of marinara until they have heated up all the way through. Thanks for stopping by CB EATS! Don’t want to miss a recipe or post on CB EATS? – subscribe to email updates or follow along on Instagram or Pinterest. The photos for this recipe look fantastic!! !